Hi loves! How are you doing? having a nice weekend? I sure am, last night the boyfriend wanted to go shoe shopping so I went along, after he found a pair we had a burger at De Burger. DELICIOUS! Today we are visiting dear friends in Amsterdam and tomorrow will be for relaxing and such. I have for you today another polish from Too Fancy Lacquer. 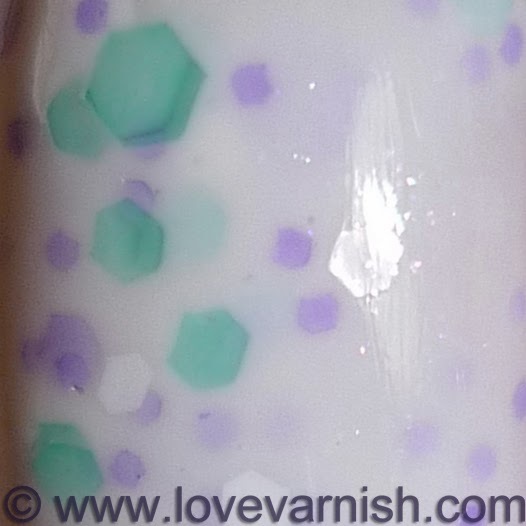 This is called Snowfall and it's a white jelly base filled with purple, mint and white hexagonal glitter and a very fine, hard to detect purple shimmer. It's a very nice take on the white based glitters out there and I love the delicate colors of the glitter. 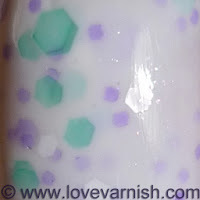 I needed 3 coats for an opaque and even result and application wasn't easy but not terrible either. I always struggle a bit with white based polishes, especially if there's glitter in there. You want an even distribution of glitter but fiddling too much with it will cause you basecolor to look ugly and patchy. There is enough glitter coming out on the brush so that helps :-). I topped with 1 coat of topcoat and it felt nice and smooth. I also included a picture with 2 nails mattified but it actually makes the glitter less visible LOL. What do you think of this one? Yay or nay? Tell me in the comments! Too Fancy Lacquer is a handmade indie brand based in Hong Kong. The formula is 3 free (no formaldehyde, toluene and dibutyl phthalate). Polish prices vary from $9,50 to $10, shipping is available for international customers at a very reasonable price ($3,50 for the first one and $0,80 for each polish you add). You can find Too Fancy Lacquer on their own website, Facebook, Twitter and Instagram. I love this, it's really soft and pretty. It is! Thanks Melissa :). :D glad you like it! Thanks Natalie, it does work well for the winter! You are always making me feel so good with your comments! Glad you enjoy the pictures! This is such a cute polish! It reminds me of something....like Yoshi or something...can't quite put my finger on it, lol! Maybe I'm thinking of Barney....I dunno, some kinda dinosaur, lol! Funny to read more people had this idea :D!